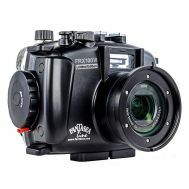 The FRX100V underwater housing was designed to fit the Sony Cyber-shot RX100 series III, IV and V digital cameras. Made from high impact carbonate plastic, controls are labeled, ranked at different heights and easy-to-use. The camera just drops in and it even features a leak detector. The FRX100V has been upgraded to include a 67mm threaded port. The FRX100V Housing is manufactured to the highest professional standards of function, style and durability. It is depth rated to 60m/200 feet and is fully functional with ergonomically designed and labeled controls. The Fantasea FRX100V is the ultimate waterproof home for the Sony RX100V and RX100 III cameras. The FRX100V Housing was designed to be compatible with a complete accessory system, enabling photographers to enhance the quality of their images.